Peace in Libya or More Chaos? L-R, Mohammed Chouaib, head of delegation from the U.N.-recognized government in the eastern city of Tobruk, Libya, Fayez Sarraj, Libyan prime minister, and Dr. Saleh Almkhozom, second deputy chairman of the Libyan General National Congress, react after signing a U.N.-sponsored deal aiming to end Libya's conflict, Dec.17, 2015 in Sikhrat, Morocco. The U.N. Security Council endorsed a new Libyan unity government Wednesday — the outcome of months-long negotiations between the country’s two competing governments in Tripoli and Tobruk. But some analysts say the negotiating process for the political settlement wasn’t inclusive enough and warn the odds are against the new government being able to bring order to the highly fractious North African country. Supporters of former Libyan autocrat Moammar Gadhafi, some powerful militias and tribal leaders in the east of the country are withholding backing the new government. Saleh al-Makzom, Libyan deputy president of the General National Congress (GNC) speaks during a press conference on Jan. 29, 2015 in Tripoli. (GNC), the first assembly elected after Gadhafi’s 2011 ouster in a NATO-supported popular uprising. The pro-Islamist rump of the GNC refused to relinquish power to the subsequent elected legislature in August 2014, setting the stage for a year-long power struggle between the dueling assemblies. Over the last year, town-based, secessionist and Islamist militias have gained strength and Islamic State (IS) militants have expanded their presence in parts of the east. The terror group controls Gadhafi’s coastal hometown of Sirte and this week posted videos of their blue-unformed police force patrolling the town’s streets. Clashes between the various players have increased in tempo and intensity. “The U.N.-brokered Libya peace agreement is hamstrung by security challenges, the uncertainty that it may actually end up producing a third power center in a country that already has two rival governments, and questions about whether the envisaged national unity government can even operate from Tripoli,” says Karim Mezran, a senior fellow at the Rafik Hariri Center for the Middle East at the Atlantic Council, a Washington-based think tank. Qatar and Turkey have supported the GNC, while Egypt along with the United Arab Emirates has been supportive of the HoR, especially of former Gaddafi general Khalifa Haftar. Last year he cobbled together what he calls the Libyan National Army from some militias and former Gadhafi supporters and presented himself as a strongman able to impose stability on the chaotic country. Egypt and the Emirates have mounted airstrikes in support of the general’s forces. That became clear on Tuesday, when the presidents of the GNC and HoR, Nuri Abu Sahmain and Ageela Saleh, called on U.N. Secretary General Ban Ki-moon to delay recognition of the new Government of National Accord, which is to be led by Faiez Serraj. The majority of the rump GNC members appear to agree with Sahmain, who has denounced legislature members who signed the deal for the Government of National Accord. Those in the HoR who back the U.N.-brokered and Western-sponsored political settlement claim they are in the majority and say they are trying to fire Ageela Saleh. But the HoR leader has had some success lobbying tribal leaders in the east and in the powerful city of Misrata to oppose the new unity government. Under the U.N. deal, a presidential council will lead a unified government whose members will be drawn from the rival parliaments and which will have to set up a Cabinet within 30 days. The House of Representatives will be the main legislature, while a State Council made up mainly of GNC members will be a second, consultative chamber. Elections are supposed to be held within six months. 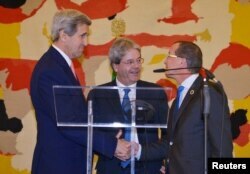 In a statement Wednesday, U.N. Special Envoy Martin Kobler acknowledged the road ahead will be difficult but said that “Libyan political actors must redouble efforts to swiftly implement” the agreement. U.N. officials are drawing some comfort from the fact that powerful militias in Misrata, as well as militias in the Libyan capital, back the settlement. 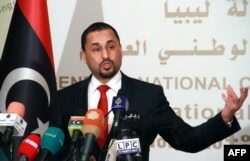 The Tripoli Revolutionaries Brigades said it will support the new government and not help the GNC to sabotage the deal. Western officials hope war fatigue, the allure of foreign aid and development money, and the IS threat will help to build momentum for the unity government and persuade opponents to hop on board. The stance of the main militias will be crucial for the future of the new government. Still, even with their initial backing, breakdowns and procedural disagreements could quickly escalate into violence. Hafed Al-Ghwell, also a senior fellow with the Atlantic Council, says it seems unlikely that the balance of power in Libya can be tilted irreversibly back to politics and away from the gun. He faults the international community for rushing a settlement to help shape a government that might agree to Western military intervention in Libya against IS, also known as ISIS. In recent weeks French and Italian leaders have expressed mounting alarm at the terror group's presence in Libya, a short boat ride across the Mediterranean to southern Europe. “Western countries want a government that will agree they can attack ISIS and one that will stop illegal immigration into Europe. But what they may have created from two rival Libyan governments is a third one,” warns Al-Ghwell, a former World Bank adviser.